Steven Spielberg's classic sci-fi story of interplanetary friendship makes a perfect picture book for the whole family. When E.T. the Extra-Terrestrial was released in theaters back in 1982, its bittersweet story enchanted millions and the film surpassed Star Wars to become the highest-grossing movie of all time. Now the cinematic blockbuster is transformed into an illustrated storybook, with col… orful, adorable drawings by Kim Smith. Here is a story you can't help but love: After E.T. is stranded on Earth, he takes refuge with Elliott, a boy in need of a friend. Together they find a way to help E.T. get back home. Along the way, both child and alien learn important lessons about courage, friendship, and the power of imagination. 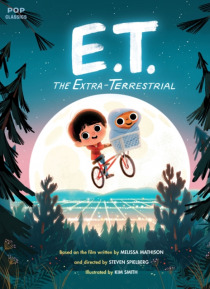 This is the perfect read-along story for children, their parents, and E.T. fans across the universe.